Two satellites that were supposed to give new perspectives of Earth never achieved orbit Friday and likely fell into the Indian Ocean after a botched launch of Orbital Sciences' Taurus rocket from California. The four-stage Taurus blasted off from Vandenberg Air Force Base at 1849 GMT (2:49 p.m. EDT; 11:49 a.m. PDT), punching through a layer of fog over the SLC-576E launch pad. The rocket pitched over and headed southward on the thrust of its Castor 120 first stage solid-fueled motor. Everything looked normal until about 85 seconds into the flight when the spent stage was jettisoned and the second stage Orion 50S motor ignited. Powerful tracking cameras positioned on the mountain peaks at Vandenberg, above the fog and low clouds, showed the Taurus suddenly veer to the left and then to the right. 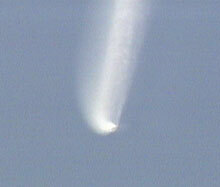 The gyrations continued for several seconds before the rocket appeared to regain control. The sight instantly brought back memories of June's failed flight of NASA's X-43A hypersonic aircraft aboard Orbital's air-launched Pegasus rocket. 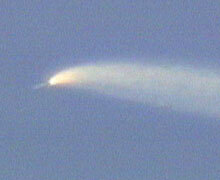 The Pegasus lost control shortly after ignition of its first stage, which is an Orion 50S motor, too. For Pegasus, the stage features a delta-shaped wing and aerosurface fins. Although appearing on video to be similar looking aerobatics in the sky, it is not known if the two incidents were caused by the same problem. The NASA investigation panel probing the X-43A accident has not completed its inqury. Orbital's Taurus program manager, Bill Wrobel, told Spaceflight Now on Thursday that engineers concluded there was no lingering concerns with his ground-launched rocket following the X-43A mishap. "We did go through an evaluation and as a result of just the complete difference in the air-launched and the type of mission X-43A was vs. what Taurus does, it is basically completely different. So it was fairly easy to clear." Unlike the X-43A mission that had to be blown up by safety personnel, Orbital engineers say data from Friday's launch shows the Taurus rocket was able to right itself and continue with the 14-minute flight. The commercial Earth-imaging satellite -- OrbView-4 -- was released from the rocket's upper stage about 12 minutes after liftoff. 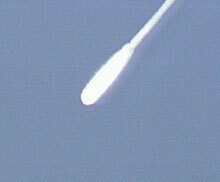 That was followed by deployment of NASA's QuikTOMS ozone monitoring spacecraft about two minutes later. But the energy and momentum lost while the rocket was gyrating meant the vehicle was unable to achieve the proper altitude and velocity to reach a safe orbit around Earth. The two satellites plunged back into the atmosphere where they were destroyed. Impact occurred in the Indian Ocean, Orbital said. Both spacecraft were supposed to be delivered into a 470 km circular sun-synchronous orbit inclined 97.29 degrees to the equator. QuikTOMS would have then boosted itself into an 800 km circular orbit over the coming three weeks. The failure was a major blow for ORBIMAGE, which is half-owned by Orbital Sciences. OrbView-4 was designed to provide high-resolution images that ORBIMAGE would sell to civilian, government and military customers. The satellite's camera was to snap one-meter resolution black and white (panchromatic) and four-meter resolution color (multispectral) images. The craft also carried a hyperspectral imaging instrument for the Air Force Research Laboratory's Warfighter-1 program. The 355 kilogram OrbView-4 would have become the first commercial satellite to produce hyperspectral imagery and allow the U.S. military to determine the value of such photos, which show the identity and quantity of materials present in the picture. The military is interested in hyperspectral imagery because it has promising uses for detecting chemical or biological weapons, collecting bomb damage assessment for commanders and finding soldiers and enemy vehicles hidden under foliage. ORBIMAGE has the OrbView-3 spacecraft set to launch next year aboard a Pegasus rocket. That satellite will offer the same panchromatic and multispectral resolution, but does not feature a hyperspectral instrument. Gil Rye, ORBIMAGE's chief executive officer, said Thursday that OrbView-3 would be launched about a year from now. 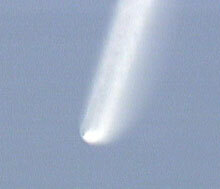 But it isn't known if officials will try to accelerate the schedule in the wake of the OrbView-4 loss. OrbView-4 was insured in case of a launch failure. For NASA, the 162-kilogram Quick Total Ozone Mapping Spectrometer spacecraft, or QuikTOMS, was built to continue the legacy of monitoring the global distribution of ozone in the atmosphere. 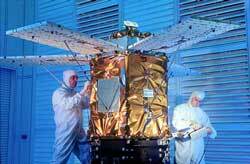 TOMS instruments flown on several previous satellites have been measuring long-term trends in the ozone and the ozone hole since 1979. 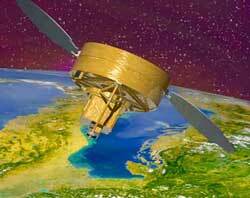 The satellite currently doing the mapping job is TOMS Earth Probe. But the craft, launched five years ago, has shown signs of aging. So NASA ordered QuikTOMS as a gap filler from TOMS Earth Probe until the Earth Observing System's Aura satellite is launched in 2003. Taurus was also carrying two canisters mounted to the fourth stage that contained lipstick tube-sized capsules of cremated human remains for Houston-based Celestis. The company offers to fly 7 grams of ashes for $5,300. The canisters were to remain mounted to the orbiting rocket stage until the spent motor naturally reentered about a year after launch. But the stage obviously fell back to Earth on Friday like the satellite payloads. Orbital said it was convening an investigation team to determine what caused Friday's failure. The company believed sufficient data had been recorded during the flight to yield clues about what caused the mishap. NASA has been invited to lend its expertise, as an observer, to the investigation, the agency said. 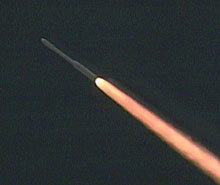 This was a commercial launch and NASA was not in control of the mission since QuikTOMS was just a secondary payload. The failure was the first for the Taurus, which had previously flown five consecutive successful missions from 1994 through 2000. 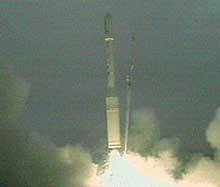 Orbital currently has just one future launch booked on Taurus -- a mission in 2003 to loft the Taiwanese ROCSAT-2 satellite. 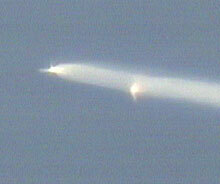 The Taurus rocket lifts off from Vandenberg and all appears to be going well. But as the second stage ignites, the vehicle loses control. 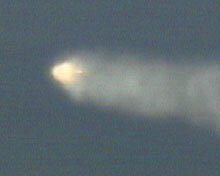 This replay shows the Taurus rocket's sudden turn moments after the second stage ignites. See our full listing of video clips. Launch site: SLC-576E, Vandenberg AFB, Calif.
Taurus vehicle data - Overview of the rocket to be used in this launch. OrbView-4 - Fact sheet on the commercial Earth-imaging satellite. QuikTOMS - Learn more about NASA's newest ozone monitor.